Please join us in our nearshore data collection efforts! The Aquatic Assessment and Monitoring Team (AAMT) has a lot of work to do and needs help from volunteers. Current volunteer opportunities are outlined and described in detail below. The type of work is separated in description by the commitment of work by time. For example there are things that need to be done once to a couple times a month; by a defined season (over the course of certain months only), and quarterly (every three months). Protocol are available for each volunteer opportunity. Please contact AAMT if you have any questions. The above map shows ANeMoNe locations for volunteer opportunities with AAMT. The following includes a description of the volunteer opportunities with AAMT that need to occur on a monthly basis or multiple times within a month. AAMT needs volunteers to conduct monthly and bi-monthly checks of the ANeMoNe sensor packages. ANeMoNe sites are within the Acidification Nearshore Monitoring Network. 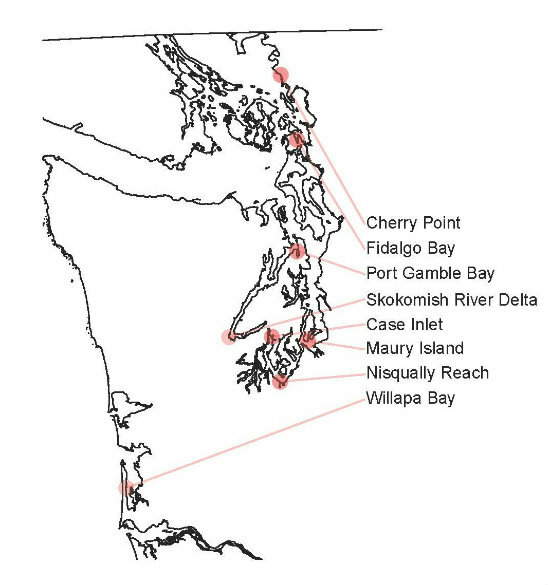 The sensor packages are a network placed around Puget Sound and along the Pacific coast to measure local variation of marine chemistry. Various circumstances can occur to the sensors that interfere with accurate data collection. Sometimes the sensors become covered with sediment and need to be unburied, or are fouled with algae and barnacles that requires removal of the items and cleaning. The sensor attachment line and floats need to be cleaned of fouling, and the screw anchor and lines need to be checked to insure they are safely secured. During the spring and summer months biological fouling can rapidly occur and cover the sensor probes. During the higher biologically active months of June through October, multiple checks of the ANeMoNe sensor packages are needed. For detailed instructions on the tasks to complete and how to check them, click here. If you are interested in helping at any of the listed sites, please contact Micah Horwith at 360-902-1017. The following includes a description of the volunteer opportunities with AAMT on a seasonal basis, meaning those opportunities that occur during a particular time of year (over the course of certain months only). In collaboration with the Washington State Department of Fish and Wildlife (WDFW), shellfish larvae settlement tiles are being deployed at four ANeMoNe sites (Port Gamble Bay, Skokomish River Delta, Case Inlet, and Fidalgo Bay) in late spring through summer. AAMT needs volunteers to help retrieve the deployed tiles every two weeks and replace them with new tiles during the retrieval process. Tile deployment apparatuses will be provided to volunteers by AAMT. For detailed instructions on the larval tile deployment and retrieval click here. Observing bird use of eelgrass and bare tideflat habitat allows quantification of higher trophic ecological functions provided by eelgrass. WDNR has been collaborating with NOAA Northwest Fishery Science Center to document and compare bird abundance and behavior in eelgrass and bare tideflat. Beach habitat use by resident shorebirds and migrating birds is valuable information. AMMT needs volunteers to help because the bird migration periods in Washington are concentrated in short bursts of time, simultaneously throughout Washington’s Puget Sound and coastal beaches. It is only possible to gather data of bird observations with assistance of a large, spatially dispersed group of observers. For detailed instructions on bird observation protocols click here. Quantifying the magnitude of water quality change provided by eelgrass habitat requires some information regarding eelgrass distribution and the proportion of photosynthetically active plant tissue. Eelgrass shoot density counts and shoot size metrics provides this data. AAMT needs volunteers during the active growing season for eelgrass in the Pacific Northwest, June through October, to complete shoot density counts and shoot size metrics. Low tides are required for this data collection effort which occur during daylight hours through the growing season. For details on eelgrass data collection protocols click here. The following includes a description of the volunteer opportunities with AAMT on a quarterly basis, meaning those opportunities that occur approximately every 3 months. AMMT needs volunteers to help swap two calibrated, charged sensor packages with the sensor packages (one in eelgrass and one in bare tideflat) that have been deployed to collect data quarterly. Volunteers interested in helping with these efforts need to indicate which ANeMoNe sites they will retrieve and deploy sensors on the sensor swap signup page. Arrangements need to be made for where and when the volunteer will pick up the calibrated sensor package and drop off the retrieved sensors. While at the site swapping sensors, volunteers can also perform the ANeMoNe Site Guardian monthly checks on sensor packages. For detailed instructions on how to swap sensor packages click here. AMMT needs volunteers to collect water samples at ANeMoNe sites. Grab water bottle samples need to occur as close to each sensor package deployed (one from eelgrass and one from bare), at each ANeMoNe site, for full carbonate and environmental DNA analysis. Sample bottles will be provided by DNR and will be labeled and prepared with sample preservatives. Detailed instructions on water sample collection will be posted here soon.